Have New Zealand’s TIMSS maths scores really improved? The latest Trends in Mathematics and Science Study (TIMSS) data has been released. At first glance, it looks like New Zealand’s maths scores have improved since 2010, but unfortunately we cannot be certain of this. The scores are published with a statistical margin of error, which means that if we were to run the survey again with different samples of children, we might not see the same “improvement”. If we include the published margins of error, we see overlapping bands of achievement rather than increasing lines from 2010 to 2014. In fact, over 20 years, New Zealand’s performance has been disappointly consistent. We’re still below average. The Ministry of Education has been honest and sober in its reporting, but nevertheless, the Minister of Education has said, in congratulatory tones, that average scores had increased! How can she claim there is an improvement when her own officials say that scores haven’t changed? Is she wilfully ignoring them, or does she needs a lesson on how to interpret statistical reports? There was some encouraging growth in Year 5 students working at an “advanced” level, but at the other end of the spectrum, less than half of the student samples were working at the desired level of mathematics in the New Zealand Curriculum, and when looking at only the TIMSS questions which fit with New Zealand curriculum expectations, the average student answered just under half of these questions correctly. We have a high proportion of under-achieving students compared to other countries, and at the Year 9 level, this proportion has grown since 1995. The Bring Back Column Addition Campaign was launched in response to New Zealand’s poor performance in TIMSS 2011(*). It would appear there is no reason to stop campaigning. We asked for some simple, pragmatic changes to the curriculum that would allow under-achieving students to progress. Without them, any improvements are likely to remain statistically insignificant. 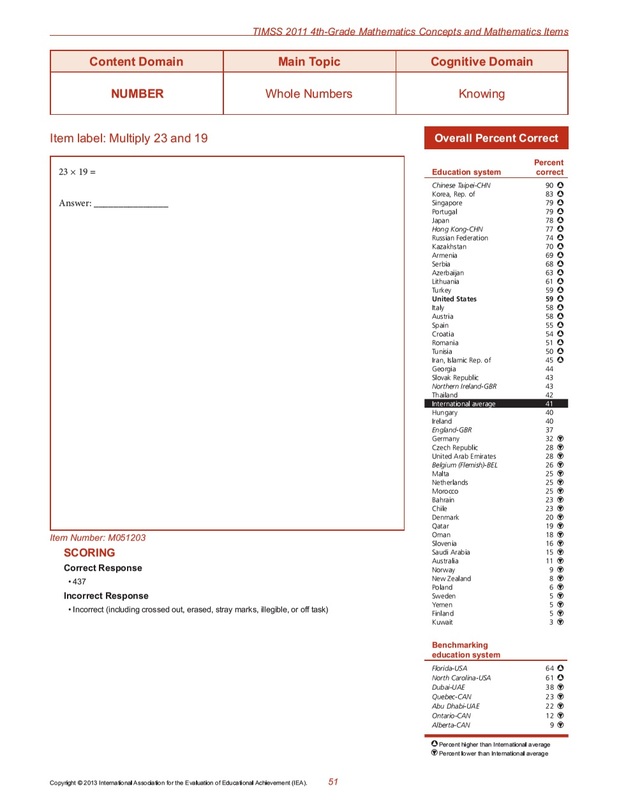 (*) Internationally, TIMSS data is labelled by the odd-numbered years in which students in the northern hemisphere are assessed. New Zealand students are assessed at the end of the year prior, hence the even-numbered years referred to in the Ministry’s reports. It’s time for New Zealand to look past the hysterical response to this year’s NCEA Level 1 MCAT exam and try to understand what’s really going on here. Was the exam appropriate in level and difficulty? In my previous post, I analysed the second of the two (supposedly) parallel papers and found that most of the questions were at a reasonable level for NCEA Level 1, and also reflective of the title “Apply algebraic procedures in solving problems”. There was a section that was more investigative in nature and new for MCAT (but such questions have appeared in other Level 1 maths assessments in the past). This section was made difficult by its poor construction and confusing wording, and most Level 1 students would have struggled to understand the intention. But most exams have a Very Hard Question (VHQ), so I guess this is the VHQ for this exam. Was it too different from previous years? MCAT was last reviewed in 2013 and is up for review at the end of this year. Whether a change in style between reviews is appropriate should certainly be up for discussion. So why did students find it so difficult? The unfortunate reality is that students did struggle with this exam. The gap between what MCAT is expecting of students, and what students are actually capable of, is widening. There are complaints that the lack of “gimme” questions at the start of the paper has left students “shell-shocked” and “killed” their confidence. Are we seriously saying that our students are capable of factorising a quadratic when explicitly told to do so, but they are unable to decode a basic word problem and factorise a supplied quadratic expression for themselves, even though they probably wouldn’t know of anything else to do with an expanded quadratic? What does this say about the resourcefulness or resilience of our students? We cannot blame this year’s Level 1 maths teachers for what has happened, and they should rightly feel insulted. The problem started many years before this one. Let’s do the maths. Year 11 students in 2016 were Year 8 students in 2013. This is the generation of students who were failing to grasp maths fundamentals such as fractions and decimals in Year 8. What we’re really seeing here is the fruits of a flawed primary maths curriculum floating its way through the system. Even two and a half years at secondary school isn’t enough to turn things around. The damage is too great. If you look at what the Numeracy Project was trying to achieve at primary school level, our secondary school students should, by all accounts, be highly numerate problem solvers, but in fact they are worryingly innumerate and apparently not very good problem solvers either. It’s ironic that one of the big selling points of this “new approach” to teaching maths was the development of early “Algebraic Thinking”. I think we can safely call that a Not Achieved. A systemic failure in mathematics education is playing out before our very eyes. NZQA is trying to inch up the standard, year by year, when the reality is that students are actually getting worse at algebra, year by year. When students are struggling to master the basics, it’s hard to see how teachers can lift their students to the higher levels of problem solving now expected. Given that next year’s Year 11 students will be the same generation of 9-year-olds who performed so abysmally in TIMSS 2011, alarm bells should be ringing loudly. It would not be surprising if fewer students were entered for next year’s MCAT. And whilst I accept that normalisation is sometimes necessary, I do not think that assessment schedules should be adjusted to meet pre-defined targets as a standard practice. The universities have already discovered that NCEA grades are an unreliable measure of preparedness for tertiary study. The best thing NZQA can do is go back to examining algebra at the end of the year. September is a really bad time of year for students to face their first high-stakes external examination. Some students barely appreciate its significance when it is tangled up with mock exams for other topics and different subjects, and the ones that do appreciate its significance prioritise the MCAT at the expense of preparing for their mock exams. The sensible thing to do, surely, is to fold it in with “Tables, Equations and Graphs”. We’re already seeing questions about graphs in the MCAT anyway, and why shouldn’t we? Algebra and Graphs are not separate topics, they are inextricably tied. As we now see, NCEA’s compartmentalising of topics as separate assessments is hurting students’ ability to make connections and become effective problem solvers. The decision to deliver the assessment earlier in the year and have it administered by the schools has a distinct whiff of cost-cutting about it, but it has been a disaster for maths education and is costing the country dearly. If we want students to pursue STEM subjects at university, we need to give them every chance of succeeding in algebra at Level 1, as this effectively marks the fork in the road between calculus and statistics at Level 2. If we want to increase the “dollar value” of Kiwis contributing to New Zealand’s economy, fixing our maths education system is a very good place to start. The media is buzzing with excitement over last week’s NCEA Level 1 MCAT (Mathematics Common Assessment Task) examination. Students are in tears and teachers are outraged over the exam that was “very different in style” and “far too difficult”. The examination topic is algebra, specifically “Apply algebraic procedures in solving problems”. This is an external NZQA exam, administered internally by the high schools in September. Prior to 2011, algebra was examined in November, as part of the three-hour end-of-year external exam. Calculators are NOT allowed in this examination. Schools may struggle to administer the exam in a single day, so there are two similar, but different, versions of the exam – one to be delivered on a Tuesday, the other on a Thursday. Students who don’t do well in algebra at NCEA Level 1 will have limited options at NCEA Level 2. Such students are typically not allowed to study calculus at Level 2. Students who don’t do well in algebra will struggle with calculus. Students who don’t do well in algebra or calculus will find it difficult to pursue STEM subjects at university. So just how different or difficult was the exam? Now that the papers are in the public domain, I will review one of them (the Thursday paper) here. If you aren’t interested in the details, you can skip to the conclusion here. Poor wording aside, factorising quadratics is a basic algebraic procedure that is typically introduced to Year 10 students, and this question put a thin veneer of an application on top. Level 1 students should be familiar with applying algebra in the context of measuring area, albeit in the opposite direction. If they knew how to multiply two quantities to form the area of a rectangle, it doesn’t seem unreasonable to expect them to recognise that this question was asking them to reverse that process. This is a reasonable question. Students at this level should be able to solve a quadratic equation that is not equal to zero to begin with, but can be made equal to zero and then factorised. This is a simultaneous equations question, not trivial, but reasonable. This is a basic procedure, namely adding algebraic fractions. There is hardly anything to do here – they even supply the answer. The subtraction of algebraic fractions appears more commonly in maths exams because students are frequently caught out by multiplication of negative numbers. This is probably one of the questions that some people are suggesting is more suitable for NCEA Level 2. I am inclined to disagree. Certainly, a general index equation might require logarithms to solve it, but not this one. As long as students recognise that , this question is manageable. Furthermore, this index question is not much harder than index questions in previous years. Last year’s trial online EMCAT asked “What is the connection between and if ?” Again, as long as students know that , they should be able to say something sensible. In the 2014 MCAT, students were asked to solve . In summary, I feel that Question One is fair. Part (a)(i) might have deviated from early questions in past papers of the “Factorise this” or “Simplify that” variety, but the application was not particularly difficult or surprising. As NZQA pointed out last year, the title of the standard is “Apply algebraic procedures in solving problems”. This question is an algebraic substitution question. The fact that the equation modelled a parabola is again a thin veneer of an application. If students didn’t know what a parabola was, I hope they managed to ignore it and press on. Interestingly, this was one of the few occasions where the parallel question in the Tuesday paper was noticeably trickier at first appearance, because there were identical factors on both sides of the inequality and it might have been tempting to cancel them out. Unfortunately, that would have led to something nonsensical. The lack of equivalence between these parallel questions is something that should have been picked up by the examination team and corrected. Either way, as long as students know their powers of 2 up to 32, they should see that the whole number has to be less than or equal to 5. As noted above, index questions of this type have been asked in previous years. Changing an equality symbol to an inequality symbol does not affect the algebra required to solve the problem. OK, this is where things start to get interesting! Students were given 9 lines of paper in which to conduct their investigation and answer this part of the question. Firstly, what is meant by “when Janine changes the order of the numbers in Line 1”? The directness of the question “Does she get the same answer as in Line 4?” suggests that we are supposed to investigate a single event. But there are 23 ways in which Janine could change the order of the numbers. Are students expected to try all 23 ways? Over 9 lines of paper, probably not. If we are meant to infer that Janine changes the numbers only once, how can we possibly investigate if we don’t know what the new order looks like? The wording of the question is decidedly murky. In actual fact, the answer is “yes” or “no”, depending on how the numbers are re-ordered. I’ve seen probability questions in which a “yes” is an Achieved answer but a “no” is a Merit answer, but at this early stage in this question, students would be choosing a new order at random, so it would be unfair if either answer fell into a different achievement band. This question doesn’t feel like problem solving. We are using algebra to make a general observation. Students at Level 1 will have very little experience of using algebra in this way, but such questions have been seen in other Level 1 Maths assessments in the past, namely “Tables, Equations and Graphs”, an end-of-year assessment concerned specifically with the application of algebra to graphs. It is certainly possible to express the number in Line 4 in terms of the numbers in Line 1 at any given point in time. For example, if the numbers in Line 1 are called , then the number in Line 4 is . But perhaps we are supposed to pay attention to the pattern of the example numbers 2, 4, 6, 8 and call the numbers ? Is this important or is this a distraction? Janine changed the order of the numbers in Line 1 and found that it changed the number in Line 4. What might Janine’s new ordering look like? Janine wonders whether changing the order of the numbers in Line 1 will always change the number in Line 4. Use algebra to find the relationship between arbitrary numbers in Line 1 and the resulting number in Line 4. Use your expression for the number in Line 4 to explain how Janine could change the order of the numbers in Line 1 but not change the number in Line 4. My final comment about this question is the lack of continuity. In part (iii), we were to assume there was a pattern in the numbers in Line 1, but it wasn’t the pattern demonstrated at the start of the question. It appears that the 2, 4, 6, 8 pattern was a red herring, and the examination team should have chosen numbers that appeared to be more random. In summary, Question Two was fair up to part (d). Part (e) was poorly written and too hard for Level 1. This question is almost identical to Question One (a)(i) but it has an important difference. One of the side lengths is given, which means the intended factorisation of the quadratic expression for the area has been made clear. It begs the question, why was Question One (a)(i) even included?? Another open question! What’s wrong with “State any restrictions on the value of for this rectangle”? This is a “changing the subject of the formula” question, and there have always been questions of this type in previous years. Er, what’s this question doing here? This is the sort of basic procedural question that would have been better placed as Question One (a)(i). This is not a trivial question, but it is suitable for Level 1. However, it’s worth noting that the parallel question in the Tuesday paper resulted in a quadratic equation that was different enough to be inequivalent. The Tuesday students may have struggled more than the Thursday students. This should not have happened. If students weren’t sure how to answer this question, looking at (ii) would have given them a good clue! Like many NCEA questions, this is quite ‘wordy’ and requires a high level of literacy to understand the question. It also requires knowledge about the features of the graph of a quadratic expression, and the use of algebra to solve a quadratic equation. The icing on the cake is to form a percentage from the two quantities obtained (the maximum horizontal width and the width at a vertical depth of 3cm). Although I think this is a reasonable Excellence question for this assessment, it is worth noting that this question could easily appear in the “Tables, Equations and Graphs” assessment at the end of the year. There needs to be some discussion about whether or not teachers and students should expect the same knowledge to be potentially assessed twice. It seems that some schools had not yet taught their students about graphs, but in all fairness, last year’s MCAT exam had questions that required graphing knowledge. In summary, Question Three was challenging but fair, provided students had been taught the appropriate material. This exam wasn’t a walk in the park, but actually most of the questions were fair for Level 1, even if they weren’t identical in form to past exam questions. There were certainly some poorly-worded questions, but unfortunately I see them in NCEA maths exams every year. MCAT 2016 is by no means the exception. It is true that the MCAT now has fewer basic questions that test purely algebraic procedures, but most of these procedures should be introduced in Year 10, so it is not unreasonable to expect students be ready to apply them in Year 11. Given that the change in style occurred last year, I am surprised that the huge uproar didn’t occur 12 months ago. Most importantly, I believe this year’s MCAT is the standard we should be aspiring to. Media reports suggest the reality in schools is very different. I will discuss this in my next post. Oh dear, it’s that pesky maths problem that won’t go away, no matter how much Government money is thrown in the wrong direction. Whilst I would never stand in the way of any initiative that raises the bar for teaching in New Zealand, we do not need specialist maths teachers at the primary school level. What we do need is to stop asking children how they know the answer to 3 + 4 is 7 and if there are other ways to get that answer. Is it any wonder our Year 8 students are ill-prepared for secondary school maths when their precious brain power is wasted on such trivia? Such patronising recommendations from so-called “specialists” highlight the lack of understanding in New Zealand of what success in maths looks like. It is scandalous that the Ministry of Education continues to cling on to flawed ideals created by people who have no mathematical qualifications or experience, despite every indication our children are failing, year after year. They claim that implementing effective maths teaching and learning in classrooms is “challenging and complex”. It gives the impression they’d rather see students continue to fail at maths than acknowledge the compelling evidence of a quick and effective solution. The Bring Back Column Addition campaign was never supposed to be a long-term crusade. I thought common sense would prevail; how wrong I was, and how much I have learned about attitudes within the education sector. This campaign will continue until the Minister of Education and her officials acknowledge that the acquisition of basic maths skills is not negotiable. Every child should leave primary school knowing their single digit addition and multiplication facts as well as they know their alphabet. They should be able to add, subtract, multiply and divide numbers fluently. They should be able to work confidently with fractions, decimals and percentages. As clients of the system, every parent should demand this. Education professor John O’Neill says it would take 20 years to pull this country out of its downward spiral. It may well take that long, but while there are still some practising teachers who can remember life before the dreadful Numeracy Project was dispersed over the country like a gas bomb, let’s harness that experience and give our current children a fighting chance. Teachers, please let your students line up the columns and get them doing maths again. It’s the least you can do for our kids and our country. I have said very little in public about the New Zealand flag referendum, apart from suggesting that the referendum should have been funded by the sale of tea towels. If everyone who voted correctly in the first referendum bought a tea towel of their preferred flag for approximately $25, that would have covered the estimated $26 million. Given the Prime Minister’s financial acumen, I’m surprised he didn’t think of that himself. Instead, New Zealand’s coffers are $26 million poorer and our Prime Minister is still chasing a legacy. It’s not too late for John Key to leave a legacy. Instead of worrying about New Zealand’s branding and the “billions” a new flag might be worth, he should worry about the 59% of Year 8 children who are struggling to grasp fractions and decimals. He could Bring Back Column Addition and give the 48% of Year 5 children who cannot add two three-digit numbers a fighting chance. He could allow children to learn their times tables without requiring them to use “number properties” to work them out. Perhaps then, more than 8% of Year 5 children would be able to multiply two two-digit numbers. Since the Union Jack remains embedded in our national flag, let’s look at what Britain has been up to in recent years. They’ve brought back column addition, they’ve introduced testing of times tables, they’ve brought in teaching expertise from Shanghai, they’ve created a Mathematics Mastery curriculum inspired by Singaporean methods. You may not agree with everything they’re doing, but at least they’re doing something. Our mother country has recognised the widespread impact of adult innumeracy in the UK. If John Key’s government fixed our primary school maths curriculum, how much would that be worth to New Zealand’s future economy? Billions. Think about it, John. What are the chances of completing a Disney-Pixar Domino Stars collection from a fixed number of packets? It’s a strange thing for a mathematical person to say, but some people are luckier than others. Luckily for our son (or his parents), we shop at Countdown, which means he received a regular supply of Disney-Pixar Domino Stars throughout the 6.5 week promotion. It was all a bit of a yawn to me, this time round. Having calculated the chances of collecting a full set of Dreamworks Heroes Action Cards, I was neither surprised nor frustrated by the increasing number of duplicates as his collection grew. The theoretical hyperbolic growth of the number of packets he would have to open to find a new domino implied a spend of $4480 to complete a set of 50. Almost $700 per week?? Not very likely. To cut a long story short, on the last day of the promotion, we trudged home from a swap meet needing just two more to complete the set. Our chances of finding those last two looked bleak…except that a neighbour had just dropped off a big bag of 22 packets in our letterbox. As I said, some people are luckier than others, and to our amazement, our son actually found the very two that he needed! Now how lucky is that?! I mean, what are the chances…? So it was very close to a 1 in 8 chance. Our son doesn’t realise just how lucky he is. Over the past two weeks, there has been a flurry of public discussion about primary maths education in New Zealand. Two reports, released within a week of each other, came out with the same message: our primary school children are performing very badly in maths. Not exactly news, but it’s good to see the nation talking about it. But what really got people riled up was The New Zealand Initiative’s report, “Un(ac)countable: Why millions on maths returned little”, written by Rose Patterson. As the Minister of Education said herself, it provided a “fresh perspective” on New Zealand’s maths learning woes. debunking the myth that it’s not such a bad thing that Kiwi kids don’t “know” anything anymore because their strength lies in the higher-order areas of “applying” and “reasoning”, unlike their east-Asian rote-learning counterparts. Sorry, but it turns out those east-Asian kids are not only better at “knowing”, they’re also better at “applying” and “reasoning” because they’ve actually got some knowledge to work with. The report also investigated maths teaching quality in our primary schools, citing a study in which a significant proportion of 125 student teachers were unable to answer some basic primary-level maths questions. Personally, I feel this raises some serious questions about the quality of the Bachelor of Education degree. Is it not reasonable to expect that all graduating primary school teachers should be able to do primary school maths? Critics called it unfair, but Rose Patterson was professionally compelled to examine teacher quality after interviewing curriculum writer Vince Wright and maths education researcher Jenny Young-Loveridge. Both interviewees prefer to blame the failure of the Numeracy Project on its poor implementation by teachers rather than its flawed ideology. It really wasn’t the Herald’s finest moment when it accused the report, and by association the Minister of Education because she agreed to launch the report, of criticising teachers. Not one single journalist mentioned the report’s actual conclusion: that teacher quality was unlikely to have changed over the past 15 years, and that the decline in student maths performance was due to the Numeracy Project’s multiple strategy approach to numeracy and the loss of emphasis on the basics. I am pleased that I had the opportunity to speak publicly in support of our teaching workforce. Frankly, it is shameful that the people who are supposed to be looking after our teachers chose to not defend them. 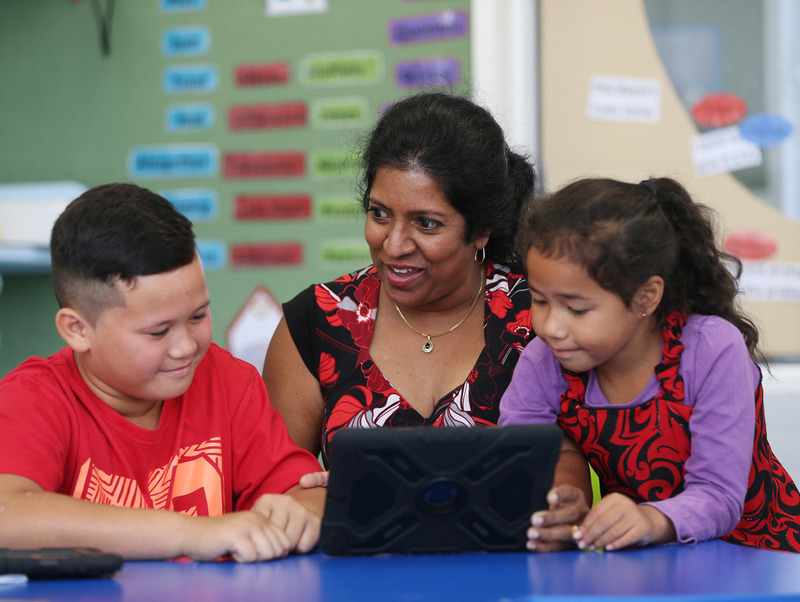 Instead, the NZEI Te Riu Roa president said underfunding for teacher professional development (PD) was to blame for the poor results, even though the report pointed out that New Zealand spends a lot of money on maths PD – more than most other countries, in fact. Even after the Minister of Education responded to the “maths problem” by promising to raise the quality of maths teaching through more PD, the NZEI president still wasn’t happy, saying things would only improve if the training was better than what’s currently available. Sigh. Result. By the way, has anybody thought about the children lately? When political and professional pride get in the way of helping our kids, it is really sad. Had certain things happened or not happened, the political response to the Un(ac)countable report might have panned out quite differently. But, having been to Wellington and heard with my own ears the Minister of Education’s response, it is clear there is more work to be done. Nobody could have held the Minister accountable for the mistakes of past governments. In her own words, the Numeracy Project “was in line with international thinking at the time”, so she missed a great opportunity to renounce it and become the public hero. Instead, everything’s gonna be alright now that we’ve got National Standards. Erm, would these be the same National Standards that her Ministry just deemed as lacking dependability? What has been truly heartening, however, is the public’s response. The Herald’s suspiciously unoriginal editorial and the unrepentant curriculum writers’ opinion editorial have been met with mockery akin to the Emperor’s New Clothes. It’s good to see the public ain’t buying it any more. I am proud of this campaign’s role in bringing the debate to this point, but merely talking about it won’t help our children. A shocking amount of taxpayers’ money has been spent on what can only be described as a failed experiment. By allowing it to continue, we are failing our children. From here on, we are all accountable.